Refrigeration must be considered as a means of delaying and not preventing food spoilage by bacteria and moulds. Furthermore, although the common food poisoning organisms are incapable of multiplication or toxin production below 5C, there is increasing concern regarding certain psychotropic pathogens capable of growth below 5C, including Yersinia enterocolitica (1C), Listeria monocytogenes (0C), Aeromonas hydrophila (1C) and Clostridium botulinum type E (3C). Management must provide a satisfactory environment during distribution to prevent contamination and multiplication of food poisoning bacteria in food. If you have any questions regarding Total Clean Solutions Container / Reefer Cleaning please call using the numbers above or contact Total Clean Solutions by our online contact form, we are always happy to assist you with any Container / Reefer Cleaning questions you may have. 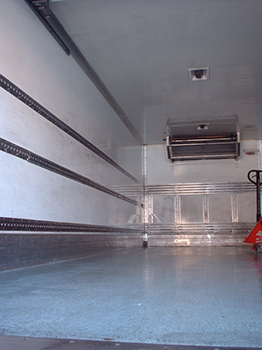 If you feel you would like to receive a quotation for a Container / Reefer Cleaning job, you can either get a online quote with the ability to send Total Clean Solutions photo's of the job that needs cleaning or call on any of numbers above.